This new volume, written and edited by some of the world's leading diabetes specialists, provides the practical information you need to care for your patients with diabetes. 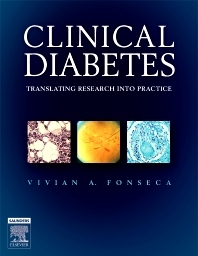 Covering such areas as lifestyle management, pharmacologic therapy, complications of diabetes, special populations and situations, and organization and delivery of diabetes care, the book offers concise, clinical advice on all aspects of diagnosis and its ongoing management. A visually appealing full-color format, with clinical algorithms, at-a-glance learning elements, and illustrations specially created for the book, makes this a highly convenient source for the practical guidance you need to manage your diabetic patients. Provides tips on how to encourage your patients to administer proper self-care. Presents new sections covering pediatric diabetes and diabetes in the elderly. Addresses problems associated with diabetes including cardiovascular disease, retinopathy, the diabetic foot, and more. Features a user-friendly full-color design, for quick and easy reference. Highlights pearls, pitfalls, key points, and other important considerations throughout the book. Offers appendices containing useful clinical checklists—such as Insulin Regimens, Insulin Adjustment Guidelines, and more. Includes a bonus CD-ROM with downloadable images and customizable, printable patient education handouts. Pearls from Major Clinical Trials—Practical Tips to Improve Outcomes: Important Lessons from the DCCT/ UKPDS/ ACCORD/ HOPE/ ALLHAT/ STENO etc.